CAPE GIRARDEAU, Mo. — Fox News hosts Sean Hannity and Jeanine Pirro joined President Trump Donald John TrumpTrump pauses Missouri campaign rally after woman collapses Fox News hosts join Trump on stage at Missouri campaign rally Nate Silver in final midterm projections: ‘Democrats need a couple of things to go wrong’ to lose the House MORE onstage at his final campaign rally of the midterms, singing the president’s praises and urging attendees to vote Republican. While Hannity and Pirro are vocal Trump supporters and frequently speak to him, it’s unusual for cable news anchors to give candidate-style speeches at campaign rallies. Shortly before taking the stage, Trump spoke with Hannity during his 9 p.m. show. The two men talked about Trump’s campaign efforts, and commiserated over the country’s immigration laws. Hannity lamented that Trump missed his opening monologue while he was traveling, but the president reassured him that was not the case. As Trump took the stage, Hannity high-fived White House communications director and former Fox News executive Bill Shine, who was observing the event from the wings of the arena. “If you like the America that [Trump] is making now, you’ve got to make sure you get out there tomorrow if you haven’t voted yet,” Pirro, host of “Justice with Jeanine,” implored the crowd. Another Fox News host, “Fox & Friends” host Brian Kilmeade, last month said he mistakenly donated roughly $600 to the Trump campaign. Keith Olbermann, an outspoken liberal, was suspended by MSNBC in 2010 for donating to Democratic candidates. Trump’s rally in Missouri was his last of three campaign stops on Monday as he sought to boost GOP Senate candidates prior to Election Day. At each event, Trump introduced prominent surrogates who whipped the crowd into a frenzy. Ivanka Trump Ivana (Ivanka) Marie TrumpFox News hosts join Trump on stage at Missouri campaign rally Hillicon Valley: Supreme Court declines to hear net neutrality challenge | How the midterms will affect the cyber agenda | Facebook rejects controversial Trump ad | Gab back online Trump’s closing argument frames midterms as a referendum on his White House MORE, White House press secretary Sarah Huckabee Sanders and White House counselor Kellyanne Conway Kellyanne Elizabeth ConwayFox News hosts join Trump on stage at Missouri campaign rally Sanders, Conway appear at Trump rally Trump’s closing argument frames midterms as a referendum on his White House MORE appeared at multiple rallies, including in Missouri, and conservative talk radio host Rush Limbaugh also introduced the president in Missouri. BENNINGTON, Vt. — One day recently, Christine Hallquist walked into the Two Brews Cafe, a homey, quirky coffee shop in this sleepy college town, and sat down at a pair of dark oak tables with a dozen local activists. They were trying to get a measure of this political neophyte who is mounting a seemingly long-shot campaign for governor. She seemed to share so many of their values, but was she serious about this? Should they go out and work for her? For Lesley Jacobson, a retired high school teacher who especially likes Hallquist’s Medicare for all pledge, one thing especially bothered her. She looked Hallquist in the eye and said one word: signs. 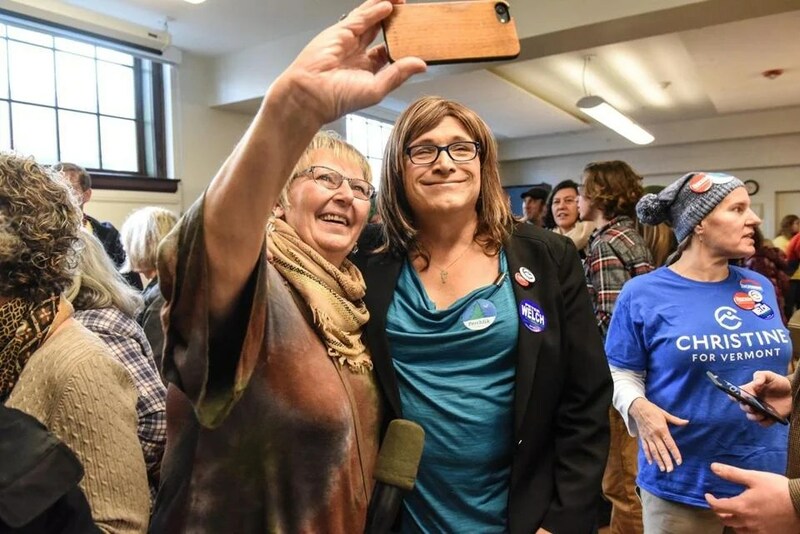 Hallquist, a Democrat, sheepishly informed Jacobson that the campaign had more or less run out of signs, and one reason for that may be who she is, the first openly transgender gubernatorial nominee from either major party. Her distinctive blue signs are being pilfered all over the state — 150 had just gone missing in Brattleboro — and she doesn’t think it’s because they’re considered collector’s items. She has also received death threats, so her campaign doesn’t put her daily schedule out in advance, which doesn’t help a fledgling politician who remains largely unknown to so many voters. Hallquist is surely fighting prejudice and ignorance in some quarters as she barnstorms across the Green Mountain State. But she’s also fighting low name-recognition, political inexperience, and the sheer power of incumbency as she tries to knock off first-term Republican Governor Phil Scott. Her campaign got some bad news last month when a Vermont Public Radio/Vermont PBS poll showed that only 28 percent of likely voters say they’ll back her. Scott came in at 42 percent. More worrisome for Hallquist is that Scott was drawing 26 percent of Democrats. Virtually no Republicans said they’ll vote for Hallquist. Hallquist’s staff say their internal polling shows a much tighter race. And the VPR/VPBS poll suggested it’s not just Hallquist who faces an uphill battle: All of Vermont’s incumbent statewide officeholders had comfortable leads as their campaigns headed into the final week. If Hallquist, 62, is worried about the polls, she isn’t showing it. Instead, she’s out there every day, all day, fully aware that, as a newcomer to politics, she has to earn every vote, and that with some 28 percent of the electorate undecided, it’s all in play. Her campaign has attracted a lot of national and international attention. When out-of-state journalists ask her what it’s like to be standing on the cusp of history, Hallquist can’t resist tweaking them, saying she realizes no one’s knocked off an incumbent governor in Vermont since 1962. Hallquist campaigned in Montpelier on Sunday. Hallquist is wary of labels, seeing herself not as a transgender gubernatorial nominee as much as a gubernatorial nominee who happens to be transgender. And while she holds progressive views on health care, climate change, and income inequality, she’d rather be known as a pragmatist. She is more policy wonk than standard-bearer. But she proudly wears her heart on her sleeve. Scott, for his part, has not made Hallquist’s gender an issue and has condemned those who have made threats against her. Scott’s supporters like to point out that Hallquist voted for him two years ago. Hallquist shrugged that off. “Everybody makes mistakes,” she cracked. A native of upstate New York, Hallquist was initially known as David and moved to Vermont at 20 when her father relocated to Burlington for work. Trained as an electrical engineer, she served as CEO of the Vermont Electric Cooperative for a decade, known for her innovative approaches to energy policy. She publicly transitioned in gender in 2015, and within a year had something of a political epiphany as powerful as the personal epiphany that led her to live openly as a woman. The Trump administration’s recent initiative to define someone’s gender as determined at birth and solely by anatomy shocked but did not surprise Hallquist. Trump remains wildly unpopular in Vermont, and Hallquist has tried to link Scott to the president. Scott scoffs at that, saying he has not been afraid to criticize Trump’s more outlandish rhetoric and actions. Polling, meanwhile, suggests that Scott has lost support not with Democrats so much as Republicans, largely over his support for gun control. Hallquist says her gender rarely comes up on the campaign trail. She says voters are interested in issues like health care and the cost of housing, not with the one that has garnered so much attention outside of Vermont. Barnstorming the state briefly took a back seat to brainstorming at Two Brews with the assembled activists. Hallquist outlined her belief that optimizing the electrical grid is the key to solving climate change, and her contention that the biggest issue facing Vermonters as it loses population and struggles to keep young people is connectivity. Living in Hyde Park, in northern, remote Lamoille County, Hallquist doesn’t have broadband. To get her chance to replace a substandard connectivity infrastructure, she has had to throw herself into campaigning. Her longtime friend and driver, Brenda Churchill, is transgender, easygoing, and a good conversationalist, which comes in handy, given how much time they spend in the car. They tool around in an orange Jeep, crisscrossing the nation’s second least-populous state, where there are not only 623,960 people, but, it sometimes seems, 623,960 opinions. Hallquist prides herself on being good on policy, but has had to push herself to engage with the people and communities she would need to represent as governor. After reading about a 30-year-old mother who died of an opioid overdose, Hallquist attended the funeral in Burlington. She’s a quick learner. Within days of hearing it from supporters, her campaign signs were all over Bennington and Brattleboro. Hallquist was standing on a traffic island recently outside a shopping plaza in Springfield with a group of Democrat candidates, taking part in a Vermont campaign staple: the honk and wave. About an hour into the exercise, the assembled group looked to their left, up the hill that is Route 106, otherwise known as River Street. A man on a bicycle was racing down the hill at breakneck speed and narrowly missed getting hit by a car as he braked hard and jumped off his bike at the traffic island. Without another word, the man climbed back on his bike and pedaled away. Kevin Cullen can be reached at cullen@globe.com. Follow him on Twitter @GlobeCullen. Polls also show Democratic nominees ahead in open seat races in Michigan, Maine and Florida; of the 33 public surveys taken in Florida since the Aug. 28 primary, Tallahassee Mayor Andrew Gillum (D) has led former Rep. Ron DeSantis Ronald Dion DeSantisElection Countdown: Trump frames midterm as referendum on presidency | Senate seats most likely to flip | Huge turnout raises Dem hopes | Controversy over Trump ad | Weather forecast has storm headed to key states | DOJ to monitor voting in 19 states Florida races could be decided by Puerto Rican voters Rains risk dampening turnout in East Coast, Midwest MORE (R) in 32. Two high-profile races in which Republican governors are retiring, in Ohio and Georgia, remain virtual toss-ups. Former Attorney General Richard Cordray Richard Adams CordrayThe Hill’s Morning Report — What if the polls are wrong? John Legend to campaign in Ohio Sunday Election Day: An hour-by-hour viewer’s guide MORE (D) is tied with current Attorney General Mike DeWine (R) in Ohio, and former state House Minority Leader Stacey Abrams (D) is locked in an increasingly contentious battle with Secretary of State Brian Kemp (R) in Georgia. Republicans remain optimistic that they can snag at least one victory, in Alaska. Walker endorsed the Democratic nominee, former Sen. Mark Begich Mark Peter BegichOne reform would have kept Alaska’s governor from quitting the race Hillary Clinton issues endorsements in key governor races Alaska governor Walker suspends reelection campaign MORE, but his name will still appear on the ballot on Tuesday. Governors’ races tend to break differently than do House or Senate contests, which are largely fought on national issues. While Democrats running for governor have focused their campaigns on health care and protecting those with pre-existing conditions, those candidates have also talked about infrastructure and education spending, issues that resonate on a state level if not at the national level. But history shows that even governors’ races are susceptible to a national electorate’s mood: In a Republican president’s first midterm, the president’s party tends to lose an average of five governorships. Republicans were confident at the beginning of the election cycle that their party would be on defense in deep-red territory President Trump Donald John TrumpTrump pauses Missouri campaign rally after woman collapses Fox News hosts join Trump on stage at Missouri campaign rally Nate Silver in final midterm projections: ‘Democrats need a couple of things to go wrong’ to lose the House MORE had won by wide margins in 2016. But the combination of weak candidates, like Kansas Secretary of State Kris Kobach (R) or DeSantis in Florida, and Democratic rising stars like Whitmer in Michigan or state Senate Minority Leader Billie Sutton (D) in South Dakota, has changed the landscape. President Trump’s anemic approval rating is also causing a drag in some states. Trump has rallied with or raised money for gubernatorial candidates like Kobach, DeSantis and Rep. Kristi Noem Kristi Lynn NoemThe Hill’s Morning Report — What if the polls are wrong? Poll: Republican Noem has 3-point lead in South Dakota gubernatorial race Election Countdown: Bomb threats raise new fears about political violence | Texas race becomes ground zero in health care fight | Florida tests Trump’s influence | Racial animus moves to forefront in midterm battle | Trump to rally in Wisconsin tonight MORE (R-S.D. ), but some Democratic candidates are pitching themselves to voters as the calm counterweights to the Trump-sewn chaos in Washington. MOSCOW, Idaho (AP) — Flyers with the slogan “it’s okay to be white” were posted on the University of Idaho campus and around Moscow last week as part of a provocation campaign by white nationalist groups. The Moscow-Pullman Daily News reports the flyers were an apparent repeat of a year-old campaign stemming from online message boards, intending to create strong reactions. Washington State University Communications Director Phil Weiler says the Pullman campus was the site of the same campaign last year. University President Chuck Staben says he is disappointed to see such flyers on campus, but personnel would not remove the ones posted on authorized surfaces, noting the university supports free speech. The Army’s military academy issued an apology Sunday for an apparent prank in which a live Air Force mascot falcon was abducted and injured ahead of the weekend’s Army-Air Force football game in West Point, N.Y.
“The U.S. Military Academy sincerely apologizes for an incident involving USMA cadets and the Air Force Academy falcons, which occurred Saturday,” said the post on West Point’s Facebook page. “We are taking this situation very seriously, and this occurrence does not reflect the Army or USMA core values of dignity and respect. Aurora, the 22-year-old white gyrfalcon that had accompanied the team for the game against Air Force’s service rival, is expected to make a full recovery, the academy tweeted Sunday evening, after she was examined by a master falconer and veterinarians at Fort Carson. After bringing her home Saturday, academy officials were encouraged that the injuries weren’t as severe as they first appeared because she was able to fly around in her pen. “It’s an extremely good sign that she’s flying,” said Troy Garnhart, associate athletic director for communications. The injuries to the bird’s wings initially had been described as life-threatening given her advanced age. Gyrfalcons’ life expectancy in captivity is around 25 years, according to tetonraptorcenter.org. “We are grateful for the outpouring of support for Aurora and are optimistic for her recovery,” Garnhart said. Aurora was being kept in the home of a volunteer sponsor, an Army colonel, as is customary whenever the Air Force team is on the road, Garnhart said. No details about when the mascot was abducted, by whom and how she was injured have been released by either academy. But the New York Times reported Sunday that Aurora and Oblio, a peregrine falcon about seven years younger, were taken by two West Point cadets on Friday night. The cadets threw sweaters over the birds, and later stuffed them into dog crates, Sam Dollar, the Air Force Academy’s falconry team adviser, told the newspaper. When the cadets returned the birds Saturday morning, Aurora had blood on her wings from abrasions likely caused by thrashing around in the crate, Dollar said. Aurora’s injuries have risen to the highest level at the military schools. AFA spokeswoman Lt. Col. Tracy Bunko said AFA Superintendent Lt. Gen. Jay Silveria has been in contact with his counterpart at West Point, Lt. Gen. Darryl Williams. Aurora was the grand dame of the school’s heralded falconry program, which includes a half-dozen birds managed by a dozen cadets. Animal abuse, specifically to an animal on the government’s payroll, is a crime in the military. The crime of “abuse of a public animal” has been on the military’s books since the Army was founded, and has been used primarily to charge those who abused pack animals, such as mules and horses. While Aurora is a mascot, the statute could apply, with a conviction potentially resulting in up to a year behind bars and a dishonorable discharge. The Gazette’s Tom Roeder contributed to this report. Mexican drug kingpin Joaquin Guzman “El Chapo” Loera may be going on trial tomorrow in Brooklyn federal court, but the billion dollar cartel he founded is still flourishing under the direction of his two favorite sons. “… The defendant’s sons remain in charge of his vast drug trafficking empire,” reads a recent letter from the US Attorneys preparing to try Guzman’s case. Brothers Ivan Archivaldo Guzman Salazar and Jesus Alfredo Guzman Salazar have been running their father’s drug empire with an iron hand while he has been in hiding and in prison in Mexico and after his extradition last year to the US. Ivan and Alfredo are said to be the drug lord’s favorite sons, the ones he personally groomed to take over the family business. They were born to his first wife María Alejandrina Salazar Hernández, whom Guzman married in 1977 in a small ceremony in a rural town in the state of Sinaloa, in northwestern Mexico. The couple had three children, but another son, Cesar, was killed six years ago. Last month, Alfredo, 32, who is also known by his underworld monikers “Alfredillo” and “Jags” was added to the Drug Enforcement Administration’s 10 Most Wanted List. Alfredo was indicted for drug trafficking in Illinois in 2009. The reward for information leading to his capture was recently increased to $5 million. In fact, like their young stepmother and Guzman’s third wife, Emma Coronel Aispuro, Alfredo and his older brother Ivan lead a flashy, entitled lifestyle in Mexico. Social media accounts linked to Guzman’s current wife, Coronel Aispuro, 29, recently showed her posing at a lavish Barbie-themed birthday party for her twin daughters in Sinaloa. Other photos show her toting expensive designer handbags and posing in skimpy bikinis on the beach. “The whole family still controls a significant criminal network and has access to huge funds,” a former DEA agent told The Post. In addition to Hernandez and Coronel Aispuro, Guzman was also married to Griselda Lopez Perez. He wed her in the 1980s and the couple had four children — Edgar, Joaquin, Ovidio and Griselda Guadalupe. In addition to his wives, Guzman has had several girlfriends, including Estela Pena, who initially rejected him. He later kidnapped her and forced her into a relationship. Another woman, Zulema Hernandez, was his lover at the Puente Grande maximum security prison in Guadalajara. She was eventually killed by Guzman’s rivals, Los Zetas. Her remains were found in the trunk of a car, the letter “Z” carved into her breasts and back. Guzman, who is believed to be 61 years old, has 15 children, according to published reports. Mexican authorities have yet to confiscate Guzman’s assets, and the family has access to hundreds of millions in the proceeds of drug smuggling, the federal source told The Post. For their part, Ivan and Alfredo make no secret of the cash they control, and regularly show up at the hottest bars and high-end shopping centers in Guadalajara, the federal source told The Post. Until recently, they have also maintained social media accounts on Instagram and Twitter that show them flaunting their vast wealth. Photos show stacks of US dollars, Gucci wallets, expensive Swiss watches, pet tigers, and a gold-plated AK-47 propped against the dashboard of a Ferrari. There are also photos of them partying with leggy women in bikinis and driving souped-up Audi Spyders that retail for more than $220,000. “The inventory is millions of dollars — Lamborghinis, Maseratis, multiple BMWs, Mercedes … Porsches,” said Patrick Curran, a DEA special agent who testified at a 2016 trial of one of the cartel’s associates. This despite the murderous battles for underworld dominance among Mexican cartels, especially since Nemesio Oseguera Cervantes — known as El Mencho — and his Cartel Jalisco Nueva Generacion or Jalisco New Generation began gaining ground as the leading drug trafficking force since Guzman’s extradition to the US. A former cop, who once shot down an army helicopter and brought Mexico to an armed standstill, El Mencho is currently the world’s most wanted drug trafficker. A bounty, financed by the US and Mexico, promises more than $6.5 million for information leading to his capture. In addition to Cesar, another of Guzman’s sons, Édgar Guzmán López, 22, was killed in a gunfight in the parking lot of a shopping center in Culiacan, the capital of Sinaloa state. After the killing, police found more than 500 bullet casings from AK-47 rifles in the parking lot. Two years ago, gunmen associated with the Jalisco cartel kidnapped Aflredo and five Sinaloa cartel associates at a tony beach resort restaurant in Puerto Vallarta. He was held for about a week, and then released, ostensibly on orders from Guzman who threatened from his Mexican jail cell to go after the families of the leaders of the Jalisco Nueva Generacion, the federal source told The Post. Since the kidnapping, the brothers increasingly like to travel by private plane, the source said. At one time, they assembled a fleet of airplanes for the Sinaloa cartel to rival AeroMexico, court papers say. The planes were also used to transport drugs. From 2006 to 2015, Mexican authorities seized a total of 599 planes from the Sinaloa cartel that flew among a network of nearly 5,000 clandestine airstrips, according to the daily El Universal. According to Mexican authorities, Alfredo, who they described as “one of the main leaders of the Sinaloa cartel,” was in charge of buying the aircraft, mainly in midwestern US states through an American associate in order to avoid suspicion. Only Americans or permanent residents are allowed to buy aircraft in this country, according to Federal Aviation Administration regulations. Alfredo has also been in charge of the cartel’s vast real estate holdings in Mexico, and oversees most of the cartel’s shipments of drugs to the US. “Alfredo and Ivan remain valid and real threats, and they will be watching this trial closely to see who rats out their dad,” said the former DEA agent. “I’m sorry, I know he lost his eye in war, or whatever,” the cast member said during a segment on Weekend Update. During an appearance on the Weekend Update segment of this week’s Saturday Night Live, cast member Pete Davidson spoke about the upcoming midterm elections and offered his “first impressions” of several candidates. Davidson’s comments about Republican candidate for Congress Dan Crenshaw — a former Navy SEAL who lost an eye to an IED blast while serving in Afghanistan in 2012 — has drawn criticism. Crenshaw’s website describes the events of his injury: “On Dan’s third deployment in 2012, his life changed forever. After six months of combat operations, Dan was hit by an IED blast during a mission in Helmand province, Afghanistan. He was evacuated and awoke from his medically induced coma learning that his right eye had been destroyed in the blast and his left eye was still present, but badly damaged. The comments about Crenshaw quickly received criticism online, with many users pointing out that Crenshaw is a veteran who lost his eye serving his country. During the segment, Davidson also mocked himself. “I shouldn’t be making fun of how anyone looks, I look like I make vape juice in a bathtub,” he said. “I look like a Dr. Seuss character went to prison.” The comedian then went on to address his recent breakup with singer Ariana Grande.